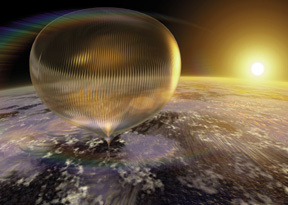 In one final aviation adventure to eclipse all others Andy Elson and Colin Prescot are preparing to fly the biggest manned balloon in history - to the Edge of Space . Using full spacesuits and seated on an open deck the crew will overtake the world's highest ascent made by two US Navy officers as part of the American Space programme almost 40 years ago. Press the forecast buttons for the latest forecast of the path of the balloon, calculated at the University of Reading, Department of Meteorology. Here you can see forecasts of the path that the balloon would follow if launched at various times into the future (indicated on the blue buttons by the number of hours after the start of the most recent meteorological forecast). The balloon paths, or trajectories, are calculated using computer models in two steps. First, the Met Office numerical weather prediction (NWP) model produces forecasts of winds and temperatures on 50 altitude levels ranging from the ground to the upper atmosphere. Their model represents the atmosphere at each level using a grid which covers the globe (like a series of concentric egg shells). Every afternoon the latest surface, radiosonde (weather balloon) and satellite observations are collected from around the world and assimilated with the model to give their best guess of the atmospheric state at the previous midday (12GMT). The NWP model is then run forwards from 12GMT. When finished in the evening, these meteorological forecasts are transferred to the University of Reading Meteorology Department and used to calculate the winds to be encountered by the balloon throughout its journey and the direction in which it would be blown if launched. Click on the blue `forecast' buttons to see the predicted path of the balloon for each launch time (the title on each plot indicates the launch time). Ten different scenarios of the balloon ascent and descent rates are used to calculate the ten coloured trajectories in the forecasts. Since the exact details of the balloon ascent and descent are not known beforehand, these forecasts give the pilots a good indication of possible landing sites for the balloon. The six trajectories reaching the target altitude of 40km give the best estimates of balloon path. It is essential that the balloon lands in the sea and a launch would only go ahead if all six trajectories were forecast to land many kilometres off-shore. The other four trajectories (blue to indigo) indicate what would happen if the balloon levels out at different altitudes. The trajectory model was written by John Methven for the U.K. Universities Global Atmospheric Modelling Programme (UGAMP), a national programme conducting fundamental research into atmospheric science, funded by the Natural Environment Research Council (NERC).